Super congratulations to Japan and the Hayabusa2 team for their successful arrival at asteroid Ryugu today! It's too late, California time, for me to write much, but I could not resist taking the latest and greatest image released by the team and using it to create a couple of my patented scale comparisons. First of all, I was immediately struck by how similar the surface texture of Ryugu appears to Hayabusa's target Itokawa. 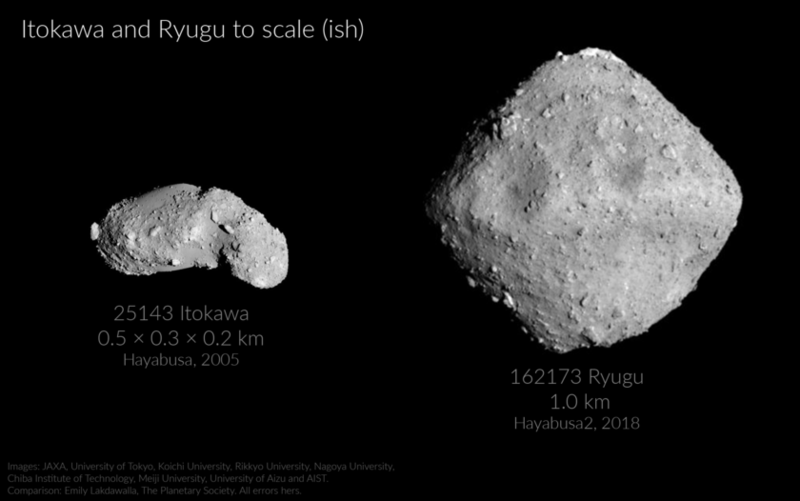 The shapes of the two asteroids are obviously very different, but where Itokawa is rubbly, Ryugu's surface looks the same -- even the boulders max out at roughly the same size. Itokawa has weird smooth "seas" that Ryugu appears not to have, but Itokawa's otter-like shape creates bizarre gravity lows that won't exist on much more spherical Ryugu. I'm calling this to scale (ish) because my knowledge of the scale of the two images isn't as precise as I'd like it to be. If I track down better scale information, I'll replace this with a modified version. Images: JAXA, University of Tokyo, Koichi University, Rikkyo University, Nagoya University, Chiba Institute of Technology, Meiji University, University of Aizu and AIST. 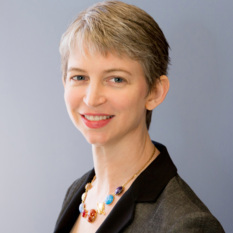 Comparison: Emily Lakdawalla, The Planetary Society. All errors hers. The two target asteroids of Hayabusa and Hayabusa2, compared. The comparison is based on less-than-precise information on the scales of the two images; it may be updated with another version once better scale information is available. Do not use for spacecraft navigation. 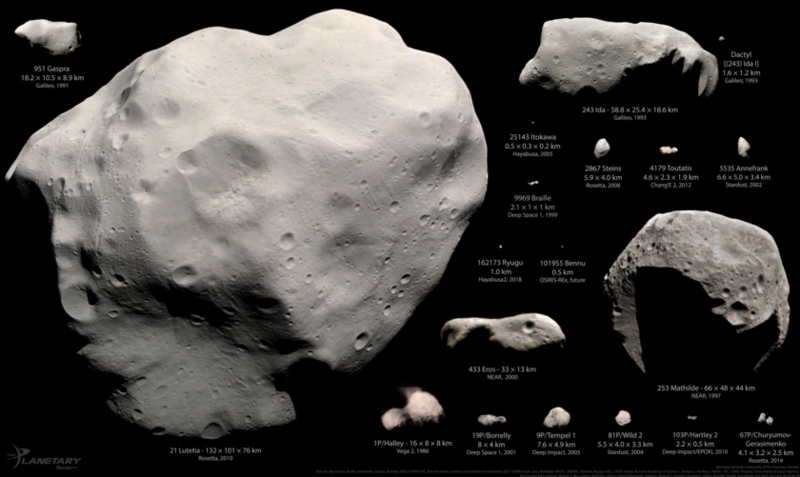 A montage of 17 of the 18 asteroids and comets that have been photographed up close as of June 2018, when Hayabusa2 arrived at Ryugu. This version is in color but does not show the bodies at their correct relative albedo or brightness. Not included are Vesta or Ceres, both of which are many times larger than Lutetia. This is a provisional version for 2018. Bennu is currently represented by a gray dot; later in the year, that dot will be replaced by a new OSIRIS-REx image, and this image will be updated. I can't wait for more from Hayabusa2! OK the increased resolution only confirms my suspicions. There's a smaller crater that's hard to see just east of the Death Star Dome--it's very apparent in the rotation .gif in a prior post. Proceeding north is a trench that looks to be the same width and definitely a repeating pattern. right at the pole is a boulder that looks distinct from the rest of the asteroid and appears to be the same width as the trench. The first explanation that came to my mind is that there was a low velocity impact, maybe a boulder that was captured and bounced north, since the trench doesn't appear to be of uniform depth? I suppose it could also be just a fluke and four impacts hit in the same line. a small body disintegrating and impacting? Amateur speculation, all. I'm really looking forward to see the results of the geology science! When might we expect that? With Rygu being in the inner solar system and Bennu possibly hitting Earth in the future, doesn't this mean Earth has not "cleared out it's orbit" and therefore isn't a planet under the IAU definition?